Matthew's Winnie the Pooh Nursery Reveal Who Loves Classic Pooh? Me! Me! Me! I couldn't wait to get pictures of Matthew's Winnie the Pooh nursery reveal online! There is so much stuff to see that I can practically hear the "ooohs" and "ahhhs" streaming right out of my computer's speakers. If ever there was a room that needs to be seen; this is it! Matthew may outgrow the crib all too quickly but the design of this room will never, ever go out of style. The design will still be fresh and fashionable when the next baby arrives! Petchie has decorated with her family planning in mind and I know that you all can't wait to see more so I'll stop voicing my extreme admiration of her baby boy's room that she put so much thought, energy, and love into so that we can proceed with the tour. I chose a Pooh nursery theme because when I was a child it was my favorite show; my mom even used to call me Pooh. I wanted my baby boy's nursery to have a timeless design, so I went with an old fashioned, classic Winnie the Pooh decor rather than a more modern version. I love vintage Pooh decor because the colors are softer. Neutral colors of gold, antique white and sage green blend perfectly and are suitable for a baby boy or girl. One of the first purchases made to prepare for the project was the gold-framed Winnie the Pooh art prints for the wall behind the crib. They are the perfect inspiration pieces for this nursery theme, soft, sweet and timeless. Vintage atmosphere was important to this mom-to-be but it was also important that the room be gender neutral since plans to have more children in the future would possibly mean that a gender specific room would have to be re-decorated. 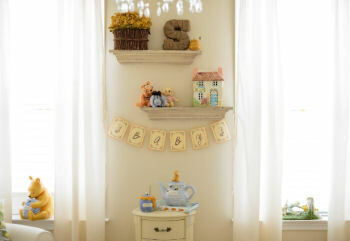 Another reason that a Winnie the Pooh nursery is perfect for this baby is that it is a very popular gender neutral theme which, if more babies are planned, is very frugal. 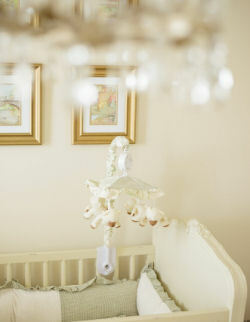 Please visit Petchie's BlogBook to see more (and larger) gender neutral nursery pictures by MJ Photography. The crib bedding set was an online purchase made by Matthew's grandmother. The sage green gingham check and toile fabric pattern combination features two classic favorites complementing the vintage atmosphere of the space. A collection of cookie jars and Pooh bear collectibles on display. The shelves were picked up on clearance sale at a nice discount. The honey pot, teapot and other vintage cookie jars were lucky eBay finds. Every Winnie the Pooh nursery should have its very own honey pot! 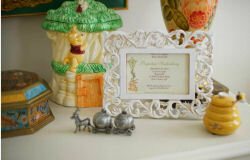 Petchie's framed Winnie the Pooh baby shower invitation surrounded by cookie jars. 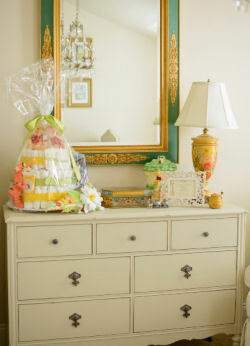 Decorating the top of the baby's dresser is a challenge for many DIY decorators so I am thrilled that Petchie has shared her photos with visitors that stop by Unique Baby Gear and Nursery Ideas. A Winnie the Pooh diaper was made by Matthew's grandmother for the baby shower. The elegant mirror and lamp are also gifts from grandmother. A comfortable nursery chair where Matthew and his parents will spend many hours reading their favorite storybooks. The throw pillow featuring some of the books' characters will add back support while the pouf ottoman provides a place for mom and dad to put their feet up at the end of the day. Speaking of endings; this brings us to the close of Matthew's Winnie the Pooh nursery reveal. Thanks so much for taking the tour with us and thanks to Petchie for allowing us to share her nursery decorating ideas with all of you.